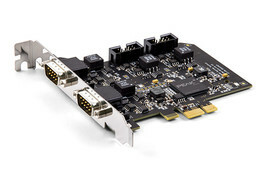 The plug-in card PCAN-PCI Express FD allows the connection of a PC with PCI Express slots to CAN FD and CAN networks. There is galvanic isolation of up to 500 Volts between the computer and CAN sides. The card is available as a single, dual, or four-channel version.